We offer conversion kits that allow E-PAK cartridges to be operated in existing lenticular cartridge housings. Adapter kits are available to convert 8", 12" and 16" housings for use with E-PAK Pilot and Commercial cartridges. Installation is as simple as removing the old tie rod and bolting down the new adapter base plate. Adapter kits are available in 316LSS and HASTELOY 276 with a 20 Ra surface finish. 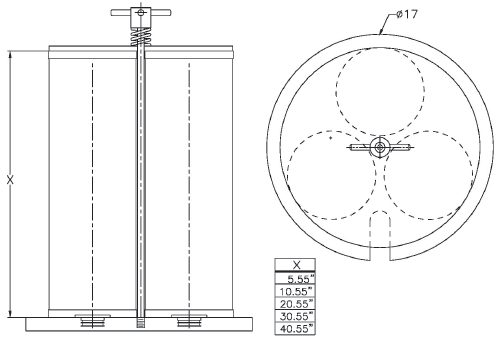 Elevation drawing shows complete adapter kit for a 16" lenticular filter housing. This allows for the use of up to three cartridges in this size housing and increases working capacity by more than 2.5X.